One of the ways you can raise a little extra money is to sell your old stuff. As long as it is in decent condition, there is a good chance that someone out there is looking for a good deal on what you have to offer. Selling on Craigslist is a great way to connect with potential buyers. Craigslist often works best when you list locally. Go to Craigslist.org and look for your local area. Many people want to find local deals so that they don’t have to worry about shipping. This can be good for you, too, especially if you have bigger items you are trying to get rid of. If there are other communities within an acceptable radius, you can post to them as well. Sometimes it makes sense to post to communities within 50 miles of your location, just for the wider audience. Make sure that meet a potential buyer in a public place if at all possible. It’s usually a good idea to try and avoid having a stranger come to your house to pick up items unless it can’t be helped. One of the keys of how to sell on Craigslist effectively is to pay attention to the description. Make sure you are accurate and concise. If you are creative, it can help to tell a story or offer a little extra insight. However, most of the time a straightforward description with appropriate keywords is the best option. Don’t forget that the image matters as well. You want to take clear images that show the item in its best light. The most successful Craigslist postings are those with good descriptions and pictures. Take that into account when putting together your listing. Craigslist is all about finding a good deal, and many of those that respond to your ad are going to want to negotiate. As a result, it makes sense to price your item a little bit higher than what you are willing to accept. That way, if you have to reduce the price to make the sale, you are still within your desired price range. Pricing is something of an art, so you might need to experiment a little to find your sweet spot. If you have particularly valuable items, sell them elsewhere. For the most part, Craigslist is all about the cheap. Newer posts are near the top, and are more likely to be seen. As a result, don’t leave a post up for more than a week. Set your post to expire after a week, and if the item doesn’t sell, re-post it at the end of that time. If your Craigslist community is especially active, it might make sense to re-post every three or four days. Make sure you are safe when it comes to Craigslist. Avoid sharing personal information when possible. It can make sense to set up an email address specifically for dealing with Craigslist. Accept cash or money orders, rather than checks, or promises of payment. 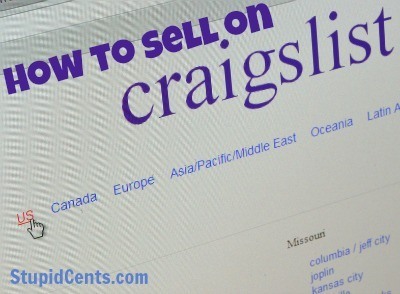 What are your best tips for how to sell on Craigslist? Hm – I’m considering selling some items before moving to a new apartment and have been trying Craigslist with no response. I’ll try these tips! Thanks. Already trying these except telling a story in the description. It’s been hard to sell my 20 year old piano and slightly newer clarinet, although I haven’t really put a lot of thought into the description.